Speaking of Martha | Small, but valuable. I couldn’t for the life of me finish a post I was working on yesterday (not the one that actually got posted). What brought me out of the funk? Cookbooks, of course. The new books cart rolled on by, and I snagged not one, but two cookbooks to keep me busy for the next few weeks. If all else fails, food helps me feel good about life every time. 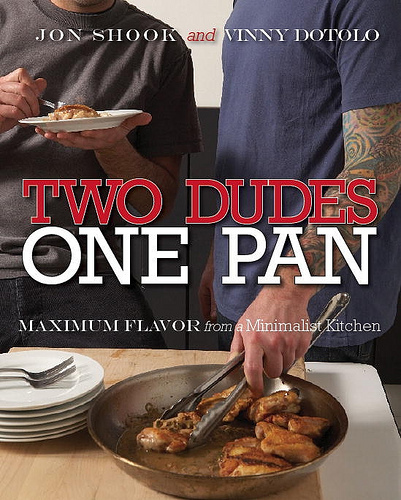 Winning book number one is Two Dudes, One Pan: Maximum flavor from a minimalist kitchen. It looks like something I might want to keep around for longer than the one-month library loan period. One of the recipes that made me want to head towards the closest kitchen is Grouper with Lemon-Caper Butter. Have I mentioned that I think butter should be a food group (and not that stinky tiny one at the top of the pyramid)? 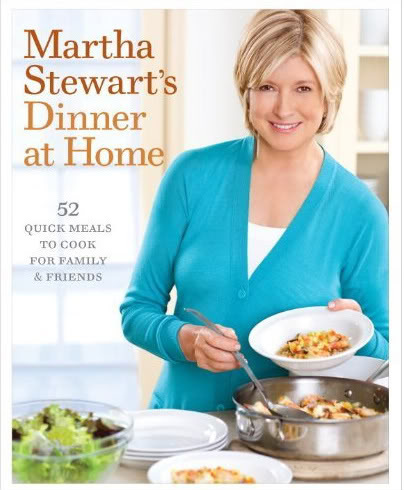 Winner number two is Martha Stewart’s Dinner at Home: 52 quick meals to cook for family and friends. My idea of quick usually includes cereal or leftovers. If Martha wanted to turn my love-hate relationship with her into a love-love relationship, all she would have to do is change the names of her cookbooks. Instead of defining her meals as quick, she could call them complex or dinner-party-worthy. In my opinion, both of those are more accurate descriptions than “quick.” I love her recipes. They tend to be well-written and have delicious results. It’s just her assumption that anybody can make vanilla-poached rhubarb in a flash that bothers me. If I’m going to make something like that, Martha had better acknowledge that it’s a special occasion. Okay, first you slice the lettuce in half (vertically), then you drizzle some olive oil on the sliced side of both halves. Next you place the lettuce on the grill sliced-side down, drizzle the other side and flip when you feel the urge. No, I don’t know what it’s supposed to look like when properly grilled. Sorry. I would guess sometime before it’s a drooping mess of lettuce and/or before it’s burned. After both sides of the lettuce have been on the grill, you add salt, pepper, vinaigrette and chevre to your heart’s desire. I’m guessing that a few crumbles of bacon and some roasted pine nuts wouldn’t hurt, either. Mmm. Thanks, Ron! I do, although I don’t use it often. It’s: hkiesewe.